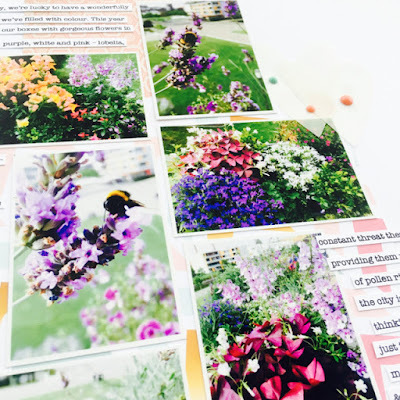 I've been thinking about this layout all week - mulling it over, thinking about how to tell my story, considering which photos to use. Today I made it happen. Go me! 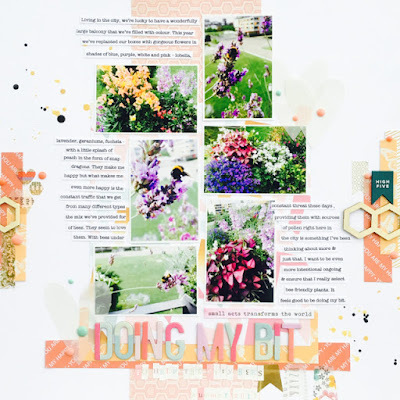 I was challenged by our wonderful Whimsical Musings bestie, Pam, to play along with Shimelle's 25 days of scrapbooking words so this layout also features "so much colour" - a colourful title. 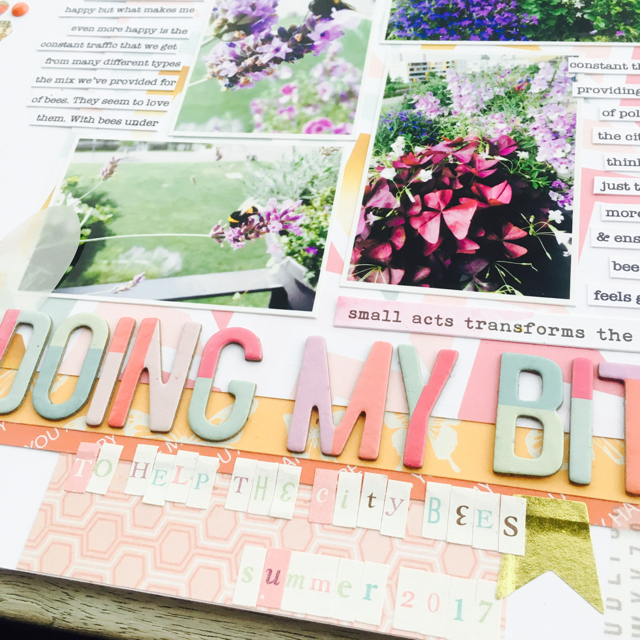 We are both on track with at least one layout each day since July 7th and are scrapping up a storm. It's simply glorious to be scrapping "with" her again after so long. Along with the Shimelle challenge, I've been using up some much older Counterfeit Kit Challenge kits and today I killed my September 2016 kit, Sundance with this layout. That also feels good and that now means that I "only" have 5 kits left to finish off - yes, still too many. 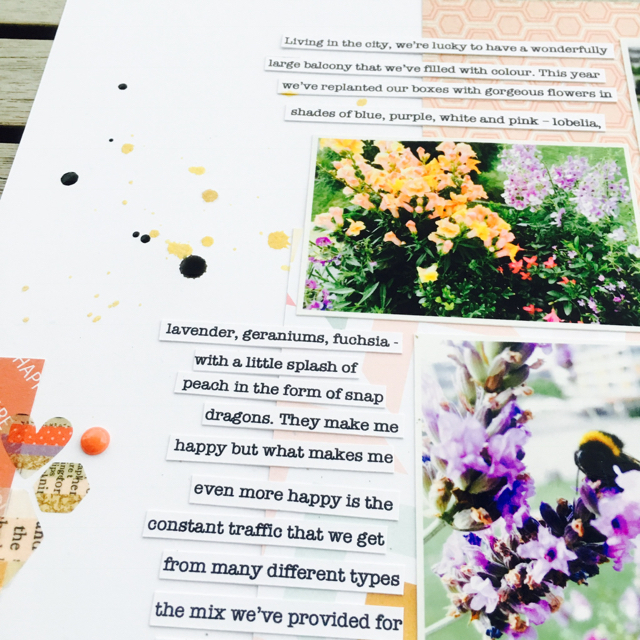 Here's my layout for WM#265 - be inspired by bees. I wanted to tie the story of our balcony to the observation of the increasing bee traffic which makes me happy and is something that's been increasingly on my mind over the last few years. I created the design of the page before deciding on which photos to use on the centre panel. I then went to town with the journalling, printing it out to save space, and finally embellishments. It took my longer than it should have because I was faffing a bit but finishing off the kit brought this together more quickly than others in the last week. Overall, I'm really happy with this and the story captured. Win, win. I'd love to know if you've recorded something inspired by this - or in fact any other - prompt. 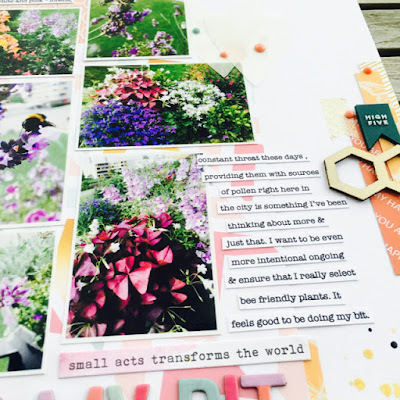 Don't forget you can share in the following ways!